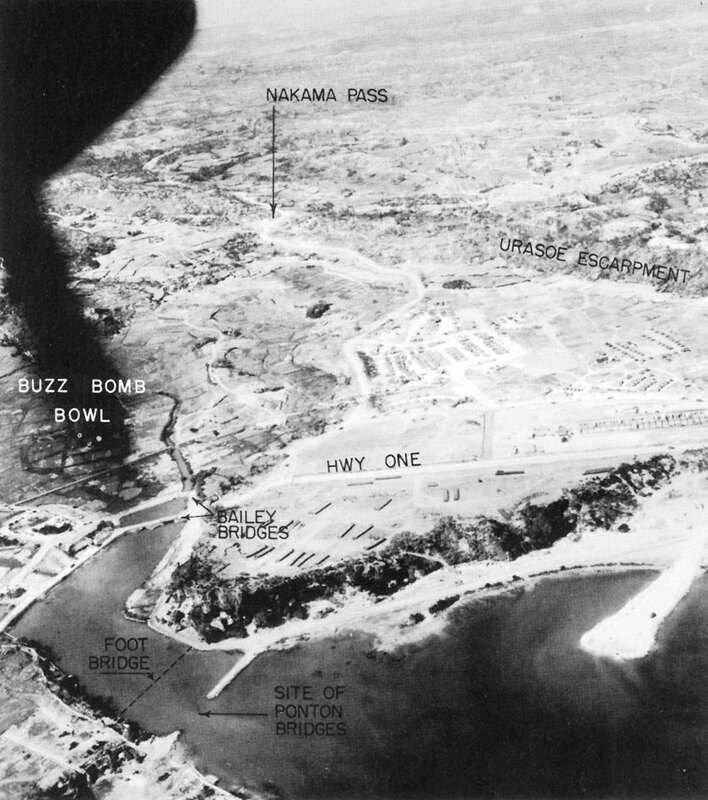 Aerial view of part of Ie Shima. 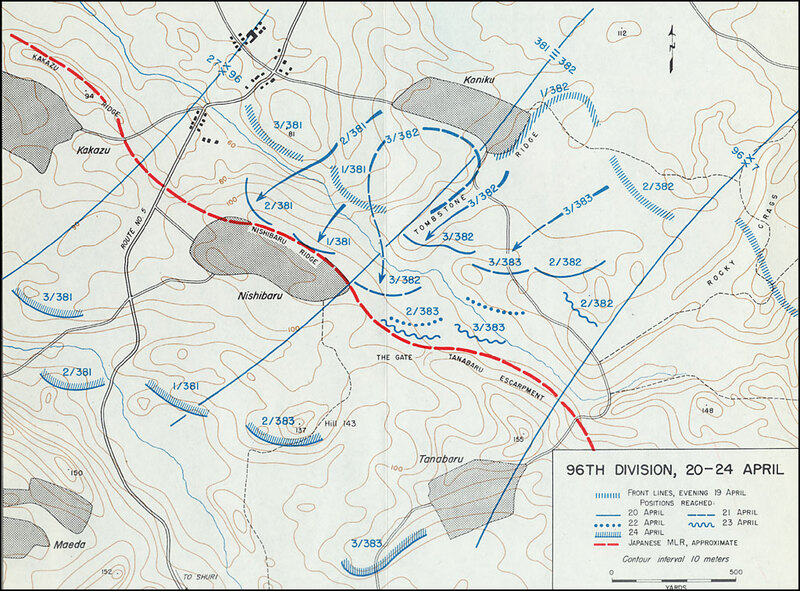 ATTACK ON BLOODY RIDGE of 20 April was marked by severe fighting. 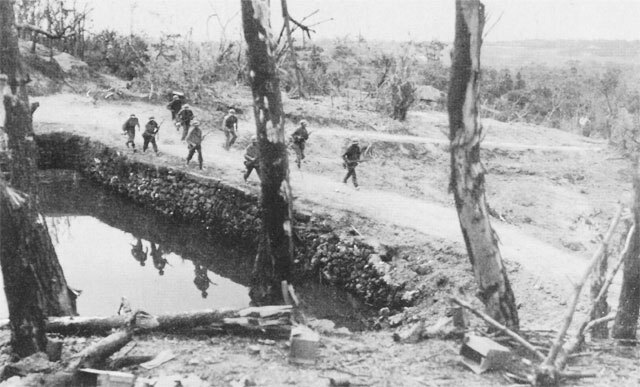 Infantrymen of the 307th infantry, 77th Division move on the double toward Government House Hill, on the ridge. 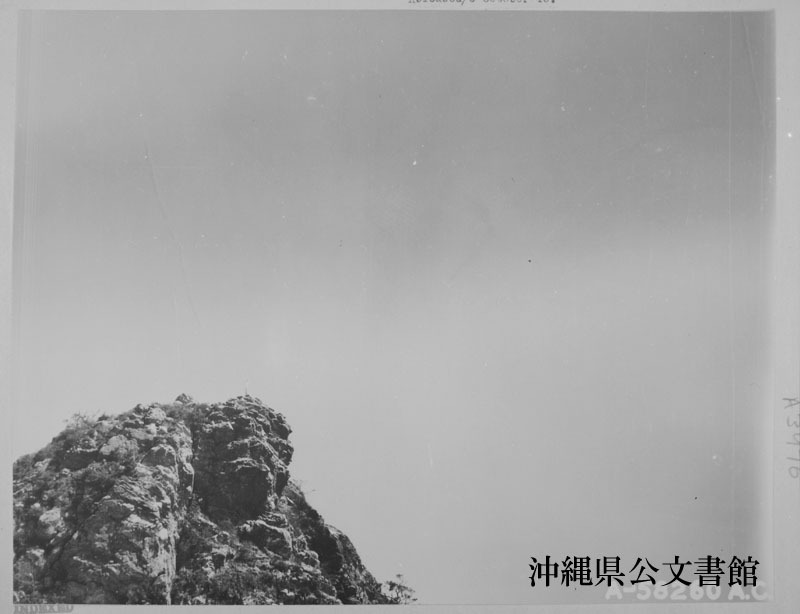 WEST END OF URASOE-MURA ESCARPMENT, area of 27th Division attack (photographed 10 July 1945). 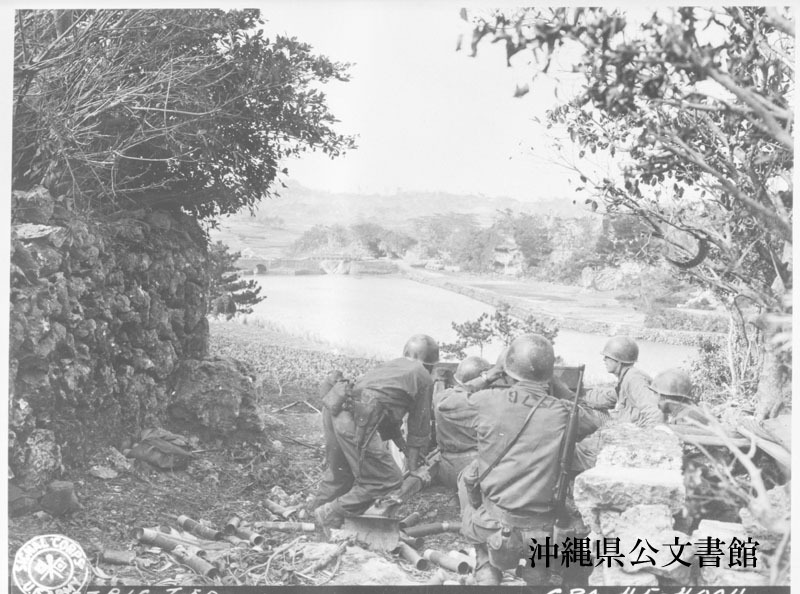 Okinawa-Guns & Weapons -Guns 37mm. 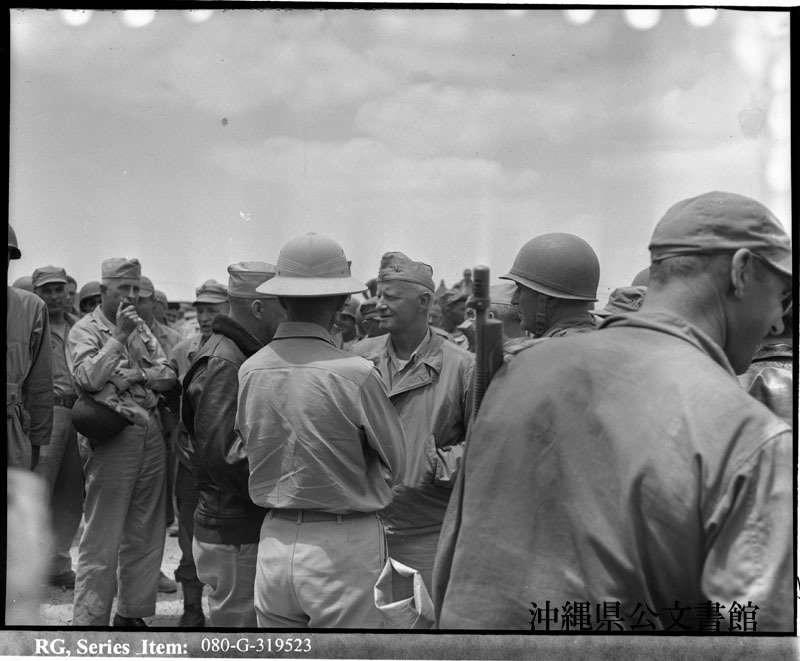 Adm. of the Fleet Chester W. Nimitz at Yontan Airfield, Okinawa, Ryukyus. Adm. Nimitz, Adm. Raymond A. Spruance (back to camera) and Gen. Simon B. Buckner. 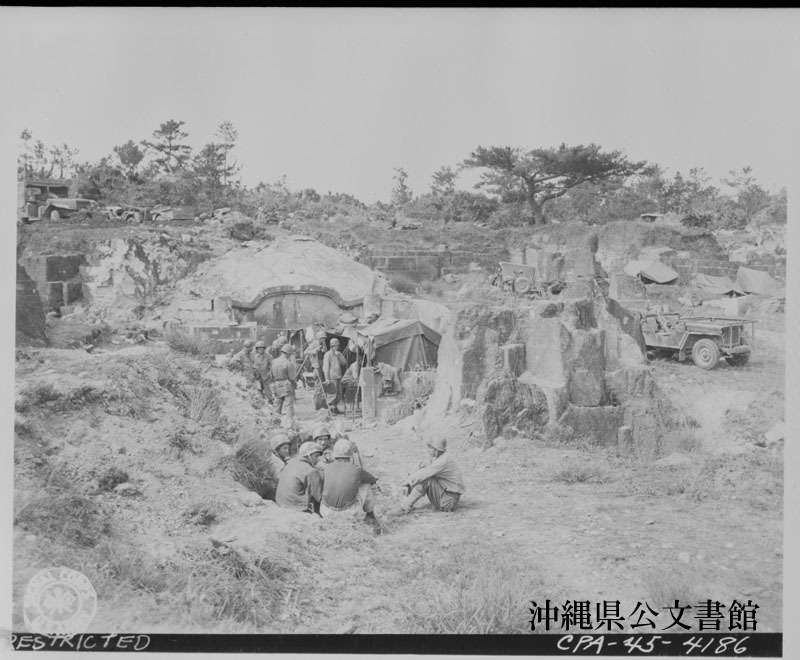 CB camp at Okinawa, Ryukyus. 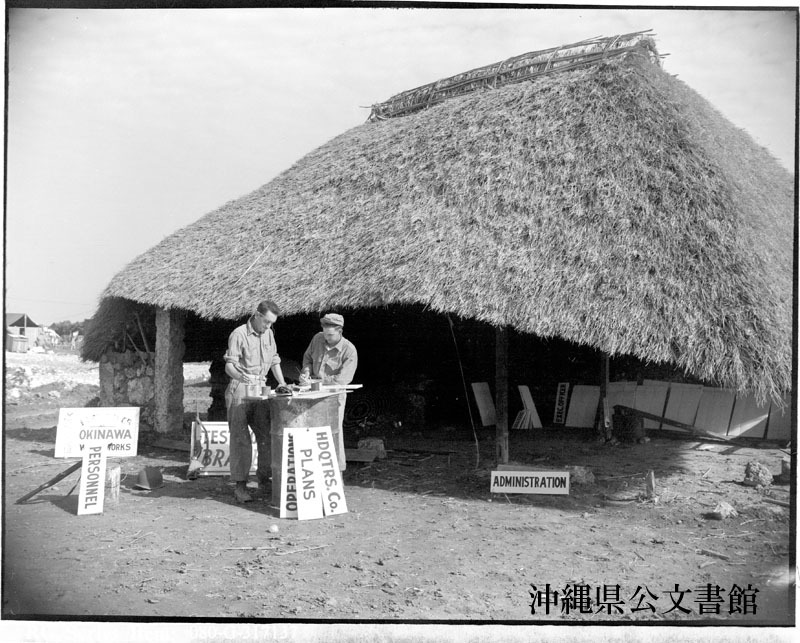 Standing in front of thatched native hut which was turned into busy sign emporium are (L-R); Francis W. Flanagan, Ptr2c, and Earl G. Ogborn, Ptr3c. 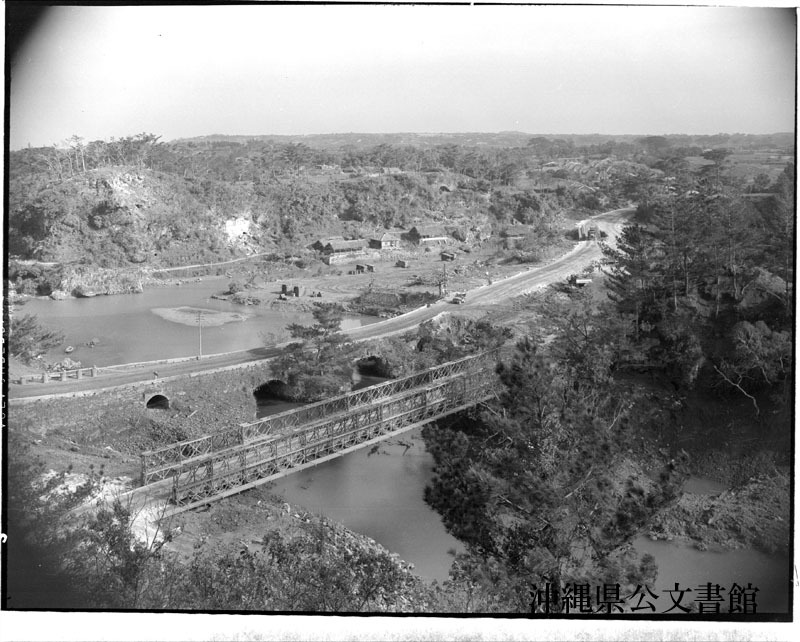 Old Jap bridges, lower left and upper right, paralleled by new CB-built Bailey bridge near Hiza [Hija], Okinawa thrown up overnight to provide two-way traffic for hard-pressed army on south front. 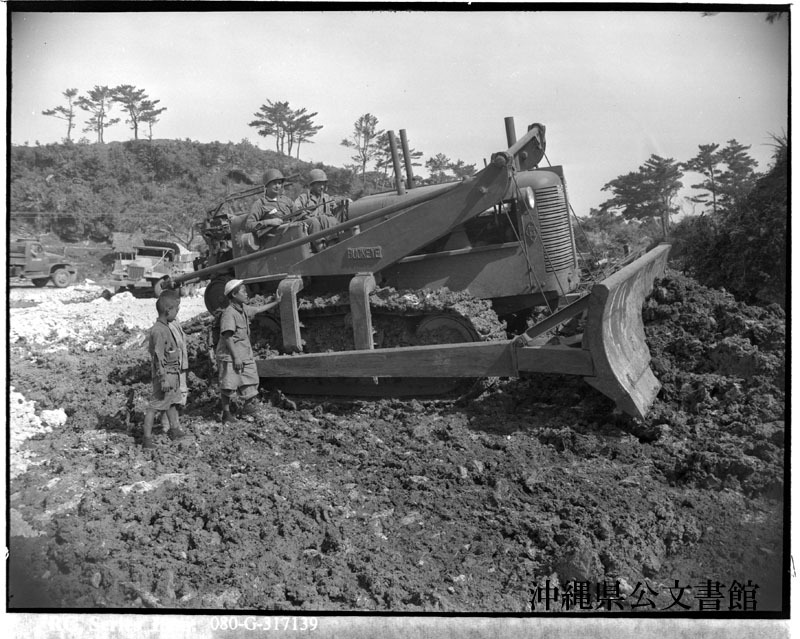 Construction on a main trans-island highway at Okinawa, Ryukyus. 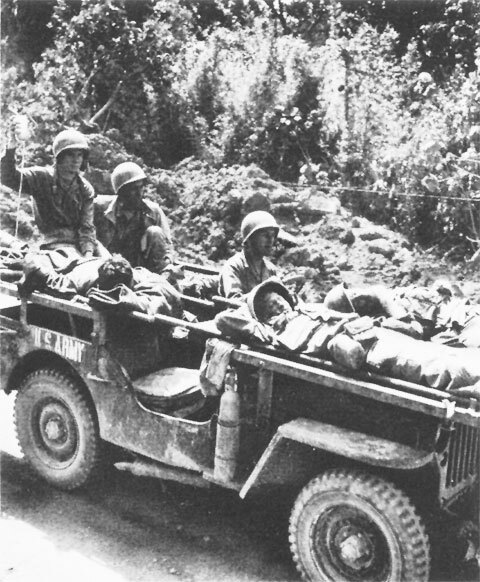 L-R; E. C. Paluch, MM2c, and E. P. Gray on bulldozer working on Route #1, as unidentified children look on. 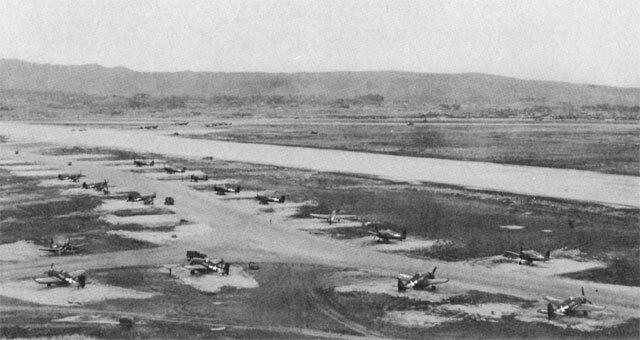 DEVELOPMENT OF AIRFIELD at Kadena (photographed 20 April 1945) was rapid. 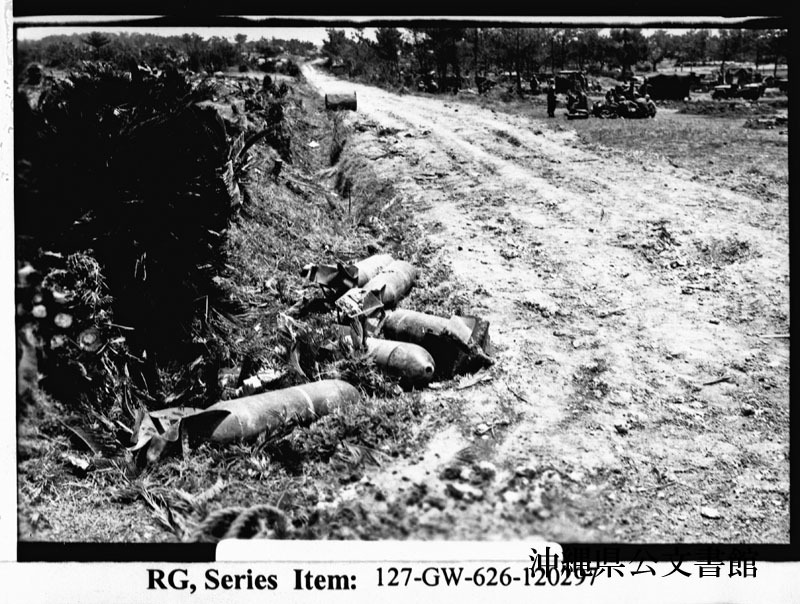 Aerial bombs that had been used as road mines on road leading to airfield on IE SHIMA. 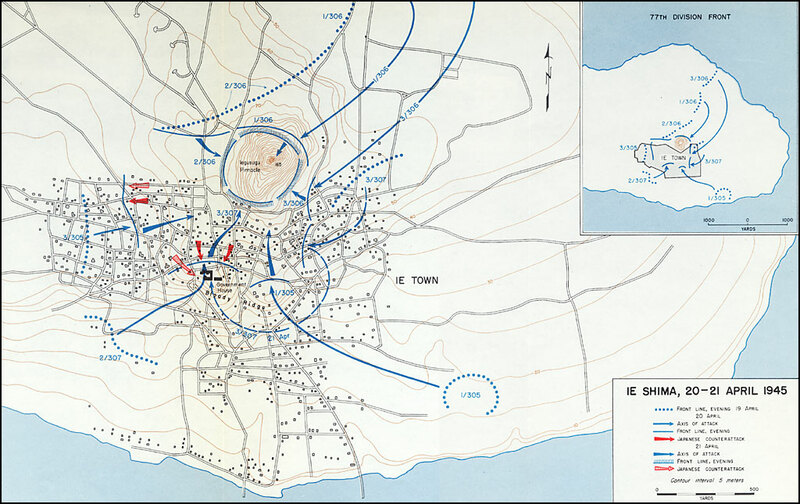 Bombs had been dug out of road and fuses removed by bomb disposal units. 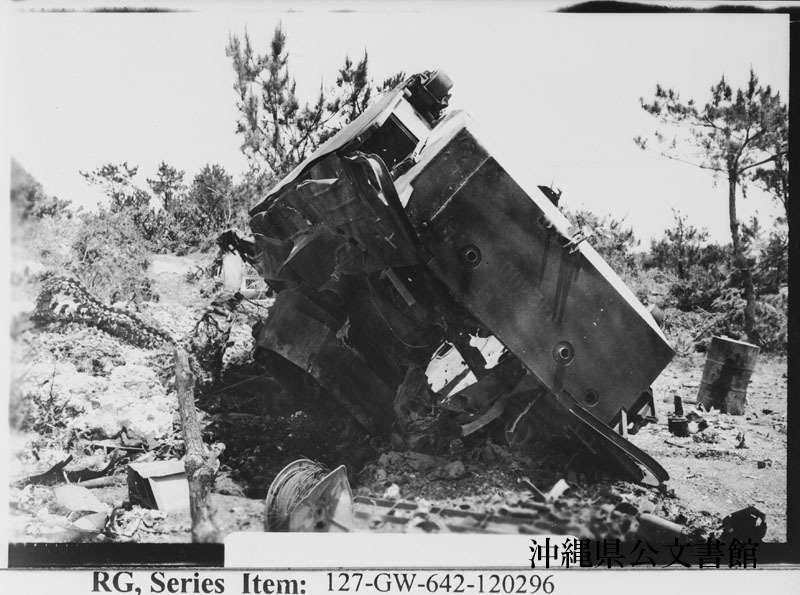 Tank possibly destroyed by aerial bomb used as a mine on IE Shima. 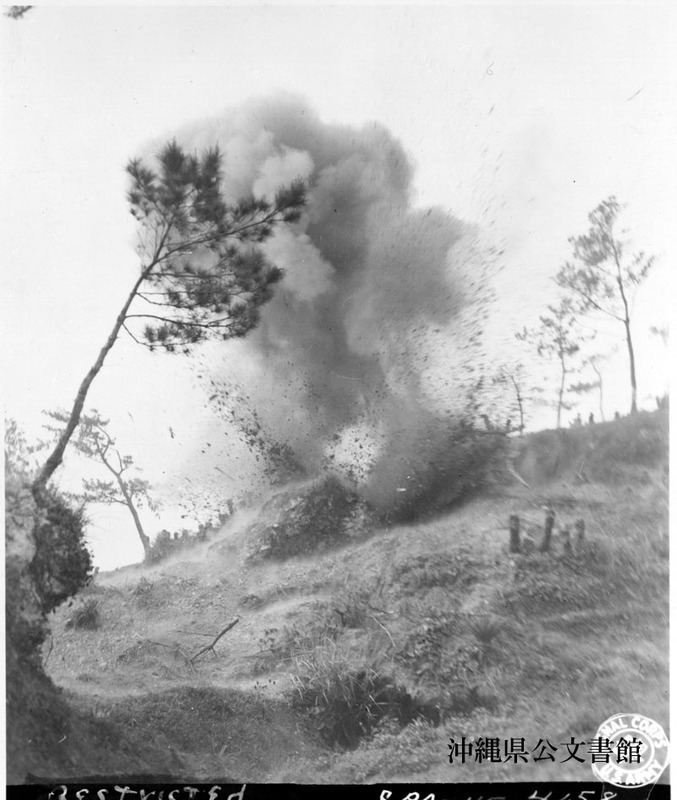 Debris fills the air as U.S. Army forces seal up a Japanese cave during operations on Okinawa. 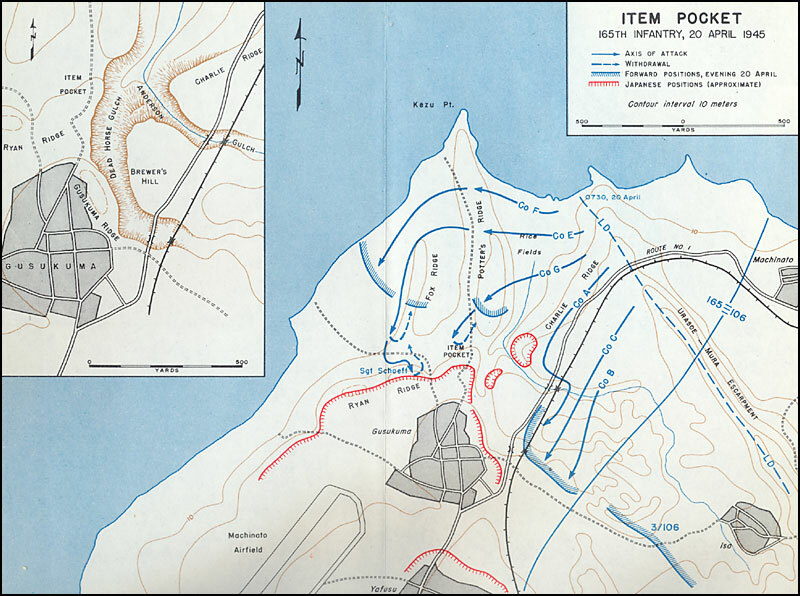 TNT captured from the enemy was employed for the task. 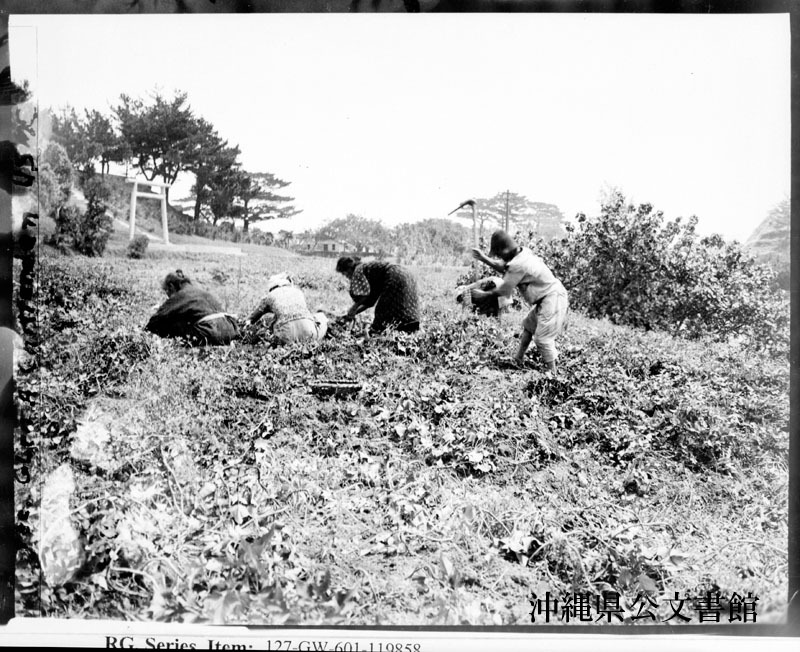 Okinawan farmer and his family digging up sweet potatoes for noon chow. 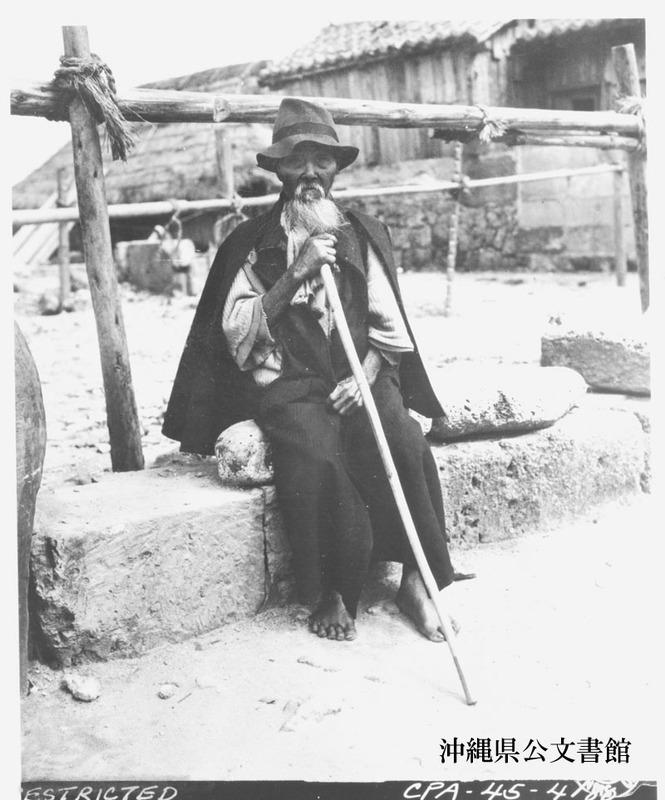 A venerable resident of the village of Shimobaru poses for an Army photographer. 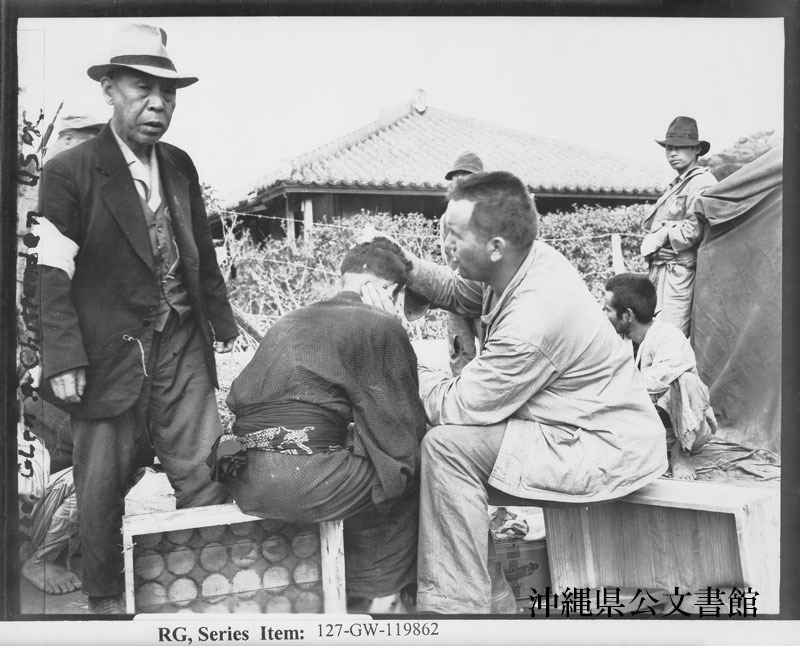 Sick call being held by a Pharmacist's Mate for male Okinawans in the compound.